Street Gourmet LA: Expo Tequila 2009 this weekend!! Tijuana will host Mexico's largest Tequila exposition, the 2009 Tequila Festival and Expo. 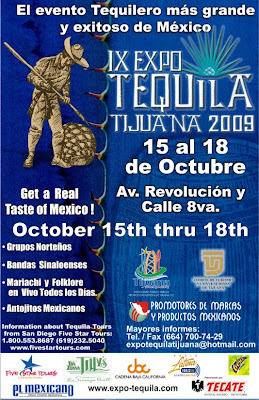 The 9th Annual Tequila festival will run from October 16th to October 18, 2009 and will feature tequila experts and distillers who will give visitors the opportunity to sample several hundred brands of Tequilas. The festival takes place on the world famous Avenida Revolución. For these 3 days, thousands of festival goers will have the opportunity to visit tequila tasting booths to sample and learn the finer qualities of tequila with experts in the industry, while enjoying live music and festival food. Tequila-Tours, a series of tequila special events presented by San Diego-based Five Star Tours & Charter Bus Company, has made going to the Tequila Festival worry free for San Diegans and visitors to Southern California for many years. 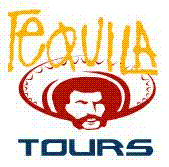 Tequila Tours is offering a one of a kind tour that makes it safe, easy, affordable and convenient for tequila lovers to attend the 9th Annual Tequila Festival and Expo and expand their appreciation and knowledge in a colorful and high energy festive environment. For more information or to book your tickets, please visit our website or call 619.232.5040. Here are some scenes from last years Expo, which I attended.Hmmm. I missed the pageant though. The Baja blog team will be joining me this trip for a reunion of our July trip sponsored by COTUCO, so look for upcoming posts from yours truly,Cathy, Javier,Josh,Pat,Abby,Fiona , and Baja blogger newcomer,Danny. We will be "sampling" tequila hitting the steets of Tijuana for another epic food crawl, no reservations style. See you at the Expo Tequila 2009 my friends.